Kitty and Sparrow is an Australian-based online store that specializes in beautiful, 100% organic cotton blankets, bibs and burp cloths for tots. With their bold, graphic prints and modern colorways, their range is fresh and contemporary — and ships worldwide! The Kitty and Sparrow story, as recounted on their website, goes: “Once upon a time Kitty met Sparrow. Together they brought a beautiful little girl into the world and, like all parents, wanted only the best for their little one. Bored with traditional colors, flimsy muslins and predictable patterns, Kitty and Sparrow created a blanket for babies and children with the ideal combination of style, versatility and quality. A blanket which parents are proud to wrap their little one in, drape over a stroller and even use themselves! And so Kitty and Sparrow was born – super stylish essentials for babies and children made with loving care in Australia.” Aaaw! The designs are indeed anything but predictable. With jaunty little, double layered, neckerchief-style bibs, and luxurious, one meter by one meter (39.4″ by 39.4″) cotton blankets, the range features modern prints based on love hearts, the game of tic tac toe, and squiggles. All products come in signature packaging, so they make perfect baby shower presents too. Kitty and Sparrow ship worldwide from their base in Sydney, and delivery is free on orders over AU$50 so it pays to stock up. Prices start from just AU$15 for a three pack of burp cloths or a single bib, with blankets at AU$49 and mixed product gift packs available too. Kitty and Sparrow also wholesale and you can contact them through their website for further details. The designs are indeed anything but predictable. 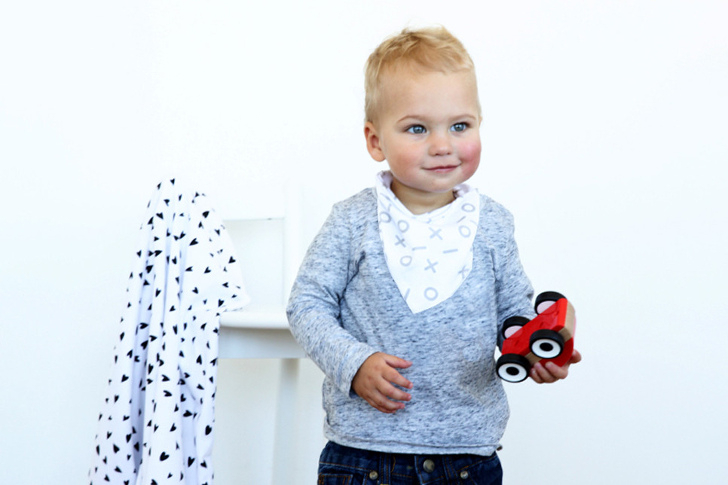 With jaunty little neckerchief-style bibs, and luxurious, one meter by one meter (39.4? by 39.4?) cotton blankets, the range features modern prints based on love hearts, the game of tic tac toe, and squiggles. Prices start from just AU$15 for a three pack of burp cloths or a single bib, with blankets at AU$49 and mixed product gift packs available too. Kitty and Sparrow ship worldwide and delivery is free on orders over AU$50, so it pays to stock up. Kitty and Sparrow also wholesale and you can contact them through their website for further details. All products are 100 percent organic cotton and made in Australia.